Every bike owner should have a reliable bike pump to inflate their tires when they lose tire pressure. Whether you need to reinflate a flat tire or need more air pressure during cold weather, having a bike pump at home means you don’t need to go to a bike shop for something as simple as putting air in your tires. Fortunately, having your own bike pump can be easy and affordable. We reviewed dozens of bike pumps to identify the best of what’s available online. We looked at manual bike pumps and electric models. We evaluated each pump’s value relative to its cost, as well as its online reviews. Our top pick, the Performance Bike Floor Pump with Gauge & Glueless Puncture Kit, offers the best combination of features for the price. It is sturdy and reliable while being versatile enough to handle any situation. It is the best option to have when you need to get your sports equipment ready. The Performance Bike Floor Pump with Gauge & Glueless Puncture Kit is our top pick. It offers the best combination of features in a pump designed specifically for bikes. It lets you inflate tires quickly and with less effect than other options. Plus, it comes with a glueless patch repair kit. One of the best features of this pump is its built-in gauge. The gauge measures in Bars and PSI, and is professionally calibrated so that it is accurate up to 160 PSI. That way, you always get an accurate reading of your tire’s pressure. The EPAuto 12V DC Portable Air Compressor Pump, Digital Tire Inflator is our runner up pick. It is one of the best options for inflating just about anything smaller than a tractor tire. The small design makes it easily portable, and you’ll want to keep it in your car when you travel. It is powered by a 12v DC connection in your car or a cigarette lighter. The best feature of this pump is its digital gauge. The gauge automatically monitors the pressure within the tire and shows you with a large digital display. It is easy to read even during the day. It also has an auto-shutoff program so that it stops inflating your tire when it is at the right pressure. That way, you don’t have to worry about overinflating tires and damaging them. The Eaaglo Mini Bike Pump is our best budget pick. Its small size and quality construction make it a great choice for anyone that needs to have a pump wherever they go. At just $15, it is easily affordable and makes a great gift for any cyclist. The best feature of the Eaaglo Mini Bike Pum is its construction. It is made out of a high-grade aluminum alloy, which makes it both rigid and lightweight. You won’t have to worry about it breaking when you need it most. 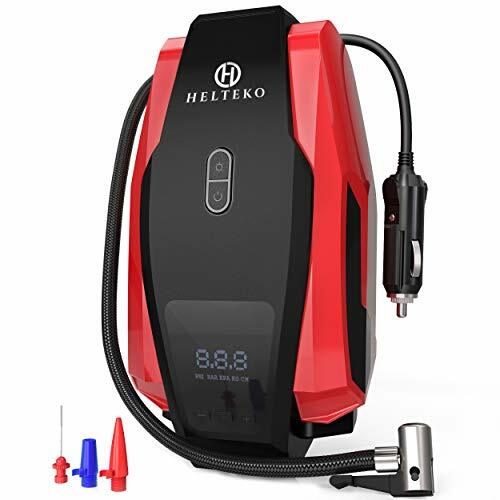 The Helteko Portable Air Compressor Pump 150PSI 12V – Digital Tire Inflator is our best electric bike pump pick. It is designed to be a high-powered, highly portable option that goes great in your car. It is made out of stainless steel and high-grade ABS plastic so that it is damage and weather-resistant. The best feature of the Helteko Portable Air Compressor Pump 150PSI 12V – Digital Tire Inflator is its automatic pumping feature. It monitors the tire’s pressure and shuts-off before it over inflates. Plus, it has a bright LED screen that makes it easy for you to set up and monitors even at night. 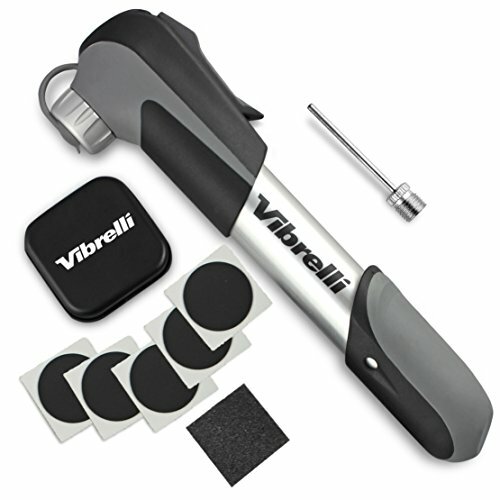 The Vibrelli Mini Bike Pump & Glueless Puncture Repair Kit is our best portable bike pump pick. When it comes to portability, it is hard to beat. It is small enough to fit in a saddle bag or a backpack. The body is made out of an aluminum allo that can handle pressures up to 120 PSI. The best feature of this pump is the Super Fit Clever Valve. It is designed to easily switch between Presta, Schrader, and Ball Needle valve attachments with minimal effort. Plus, it forms a tight seal so that it won’t leak, making inflation much faster. Bicycle owners should buy a bike pump to have on hand in the event that they need it. If you go on a long bike ride or a vacation where you’ll be needing your bike often, you may want to bring along a small bike pump with you. If you take your bike with you on trips, you should also check out our review of the best bike racks (and if you cycle at night, you’ll want to invest in a bike headlight for safety). Otherwise, using your bike pump should be a regular part of your bike maintenance routine. Having a bike pump is important for parents, recreation centers, and schools, who need to be able to inflate bike tires and, in some cases, sports balls on-site. Some recreation centers and schools have more than one bike pump available through their PE programs and clubs. For these uses, choosing a bike pump that can inflate other types of sports equipment. Color. While many bike pumps come in basic black or metal, some bike pumps are available in a few color choices, such as red. Ergonomic. Most bike pumps are only used infrequently and for short periods of time. However, if you plan to use the bike pump to inflate a fleet of bikes or use it very frequently, choosing an ergonomically designed manual bike pump can make it more comfortable to use. Metal composition. What metal the bike pump is constructed with has a lot to do with its weight and durability. Bike pumps are made from aluminum, steel, and plastic. Size. Some bike pumps are larger than others. If you plan to bring your bike pump with you on your rides or don’t have a lot of space to store it, choosing a smaller model is a good idea. PSI. A measure of the Pounds per Square Inch, or how much air pressure is created by the pump. While many bike tires can be inflated with relatively low PSI ratings (under 100 PSI), mountain and road bikes often need pumps with higher PSI ratings. Pressure indicator. A pressure indicator or pressure gauge measures the pressure inside the tire so that you can tell how much more air is needed to be properly inflated. Valve type. The type of valve on the tire. Bikes use Presta, Schrader, or Donner valves while balls and other equipment have specialized valves. Brand. The company that makes the pump. There are many companies that have a long history of making quality bike pumps and you want one you can rely on when traveling. Weight. The overall weight of the pump itself. While most pumps stay at home, portable and mini pumps go with you as you ride. This can affect the weight of the bike and how much effort is needed to pedal. Portability. How easy it is to transport the pump. Larger electric pumps require power sources and are too have to take with you while mini pumps are small, lightweight, and designed to travel. What is a bike pump and how does it work? A bike pump is a tool that is used to put air into tires, specifically for bike tires. Every type of tire has a pump designed for it, but many pumps can be used for multiple types of tires. The pump uses either an electric motor or a manual cylinder pump to draw air in, compress it, and force it into the tire. Bike pumps are usually manually operated and use a manual cylinder pump to compress air. You attach the pump’s hose to the valve on the tire. Once it is locked into place, you pull the handle on the pump out to draw air into the pump. Then, you push the handle down to compress and insert the air into the tire. How much air do you put in bike tires? The amount of air that you put into a bike tire depends on the type of tire that you need and your riding conditions. Wider tires often need more air since they have more open space on the inside. Cruisers have the lowest tire pressure requirements since they are expected to encounter the least amount of stress. BMX, mountain bike, and road bike tires can have considerably higher air needs since they are put under a lot of stress. Tire pressure is measured in either Bars or PSI (Pounds per Square Inch). The inflation requirements are written on the side of the tire or the pack that the tube replacement came in. It is important to keep the pressure close to the required amount since failing to do so can cause the tire to break or your ride performance will suffer. Many pumps have pressure gauges built in, but you can also get a separate gauge to keep with your pump. 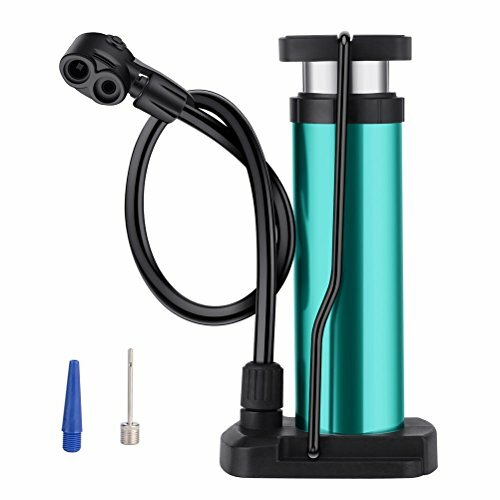 Can you use a ball pump for bikes? Pumps can be used interchangeably as long as they have the right valve type and a high enough PSI/Bar rating. Sports balls like basketballs and soccer balls use a special type of valve that is designed to flex with the ball and hold air in under extreme pressure. It is not the same as a bike tire valve. However, many pumps are designed to change valve types so that they can be used for multiple purposes. For a ball pump to work on a bike tire, it must be able to convert its valve to a Schrader (like a car tire valve), Presta (the valves on high-end road bikes), of Donner valves. Likewise, the PSI rating must be high enough. Many ball pumps have a lower PSI rating than what is needed for a tire. Most tire pumps have ratings in the 120-200 PSI range. For your ball pump to work easily, it should have a PSI rating of at least 120. A lower rating may allow you to get air into the tire, but it will be much more difficult and will likely damage your pump permanently. Why can’t I pump air into my bike tire? If you are trying to pump air into a tire and it is not working, there are two main reasons why you are likely having trouble. The first is that the valve seal is not tight. Check to see if you have the right valve on your pump. Many pumps come with dual-head valves for Presta and Schrader valves. Make sure you are using the right one. Otherwise, make sure that the valve is on properly, fully inserted, and locked into place. The other possible issue is that your pump is too weak to put more air in. If your pump has a low PSI/Bar rating, it may not be able to generate the pressure needed to inflate the tire. However, use a pressure gauge to check the pressure in your tire. If you have a high enough rating and you can’t pump anymore, you may be at your tire’s maximum inflation limit and you could pop it by continuing to pump. We looked at 20 other bike pumps. Even though they didn’t make our 5 best bike pumps list, they’re the best of the rest and each is still a great option for your bike. The information you’ll need to compare each one is included with the listing. When you need a reliable and efficient bike pump when traveling, try the AstroAI Portable Air Compressor Pump 100 PSI, Digital Tire Inflator. It is electric powered and is easy to use. You can plug it into your car’s 12v port or cigarette lighter. It has a digital display so that you can easily measure the pressure of your tires, and it is professionally calibrated to be within 1% of the actual pressure of your tires. That way, you always get accurate and dependable tire inflation. If you travel a good distance to places that you like to ride, then you will want to take the BREEZZ Tire Inflator, Air compressor Pump, 12V DC Portable Auto Tire Pump with you. It is highly portable but uses an electric motor to do the inflating. The bright digital display is easy to see in any weather conditions. While it can handle lower pressure bike tires, this pump is designed to handle up to 150 PSI making it useful for cares as well. The DBPOWER 12V DC Tire Inflator with Digital LCD Display and LED Lights is a great tool to have if you need a pump on a night ride in a remote area. You can power it with your car and still use it in the dark thanks to a bright LED installed on the front of the pump. That way, you can see exactly what you are doing even in the dark. The Heavy Duty Double Cylinder Portable Air Compressor Pump:12V Electric Car Tire Inflator is another great option for filling up your tires fast. It comes with multiple power sources including a set of jumper cable clips so that you can power it directly off of a car battery. A large metal handle makes it easy to carry and it has a bright LED light at one end. It also comes with a coiling two-meter extension hose so that you can easily reach your tires. This Portable Air Compressor, Cordless Tire Inflator is a highly portable option that you can take with you in a bike bag. It is cordless, lightweight and easily portable. It comes with accessories like nozzle and tire nozzle attachments so that it will work for any tire. Plus, it is capable of handling up to 150 PSI so that it can work on even the largest tires. Despite its reduced handheld size, it is still capable of inflating quickly. That makes it a great option for getting back on the road quickly. If you want a manual tire pump, try the BV Bicycle Ergonomic Bike Floor Pump. It has a wide base so that it is stable and easy to use. The gauge gives you a bar and PSI measurement and has a moveable marker so that you can mark the pressure that you need. The valve has attachments for Presta, Dunlop, and Schrader valves. 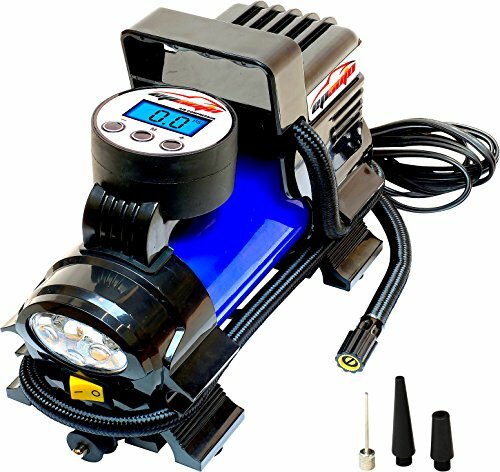 This pump can handle pressures up to 160 PSI so that it works on even the largest of bike tires. With the 34-inch long hose, you can easily reach the valve without having to be too close to your bike. If you are an avid cycler, then you should try the LEZYNE Pressure Over Drive Bicycle Floor Pump. It is built for cycling enthusiasts. This pump is made out of CNC-machined aluminum, which is highly durable and accurately cut. Because of this, it can handle pressures up to 220 PSI for road and other high-pressure tires. Plus, it has a more elegant look than most pumps. The sleek black aluminum finish and the wood handle give it a high-quality look. For most cyclists, the Mini Floor Bike Pump is the way to go. It is only 12.2-inches long so it fits in a backpack or a saddle bag. It’s compatible with Presta and Schrader valves so most riders can use it. This pump is made out of the same CNC-machined aluminum as more expensive pumps, which will make it last much longer. 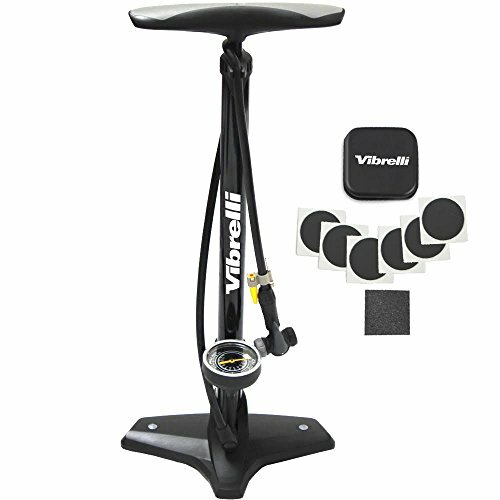 It is a solid investment for anyone who rides regularly and needs to add a pump to their riding pack. If you want a more versatile option, the Schwinn 5 in 1 Floor Pump With Gauge can be used for multiple devices. It has the attachments for Presta and Schrader valves, an air need for sports equipment valves, and an inflation cone. It also has an integrated pressure gauge to make proper inflation easier. The Topeak Joe Blow Sport III High Pressure Floor Bike Pump has a few new upgrades over the last version. It has a mounted pressure gauge to make inflation anything easier. It also has a new TwinHead DX with a 360 pivot hose, which makes it compatible with any valve type. That way, you can use it for all of your inflation needs rather than relying on several specialty pumps. The Topeak Sport II Floor Pump is an easy to use and effective model to keep in your garage. It has a pressure gauge to make inflating more accurate. Plus, it has a wide base plate for added stability. It uses the TwinHead TM valve that works with Presta and Schrader valves as well. The entire body of the pump is made of steel for added durability. The BeSpoke Cycling Gear Mini Bike Pump is a bike pump that can be mounted directly to the bike frame. That way, you don’t need an additional bag to carry anything. It is small and lightweight so that it won’t interfere with your riding. The mount does not require holes in the frame. It just clips on for easy removal and to protect your frame. The DOKO-IN Mini Bike Pump with Gauge, Presta & Schrader Bike Pump Frame Mount is designed to be a professional rider’s portable bike pump. You can inflate tires quickly thanks to its dual-action pump system. Each time you move the handle, regardless of what direction, it pumps more air into the tire. There is a gauge the measures up to 210 PSI. This pimp also comes with a mounting clamp and the additional needle so that it works with all valve types. You can give someone the SAMLITE New Mini Bike Pump Portable Bicycle Frame Pump to ensure that they have a way of pumping on the go. It has a comfort grip handle to make pumping easier. This pump comes with several extras including a repair kit and a bell. That way, you can be sure that someone is riding safely with this system. The W WHEEL UP Mini Bike Frame Mounted Pumps is one of the smallest options available at just 8.27-inches long. Its cylindrical shape and in/out pump action make it an effective pump for any tire up to 120 PSI. The valve is adjustable so that it works with Presta and Shrader valves with minimal adjustments. The MOSONTH Mini Bike Pump offers you extreme portability. It is only 4.9-inches long and 2.9oz. The mounting bracket is included for easy installation. This pump is made out of 6063 high-grade aluminum alloy to make it light but extremely durable. Even though you pump at 160 PSI losing your grip is not a problem since the surface of the pump is textured. The valve itself is also made out of high-grade aluminum. This NewMainone Mini Bike Pump Portable Bicycle Frame Pump makes pumping easier with a pressure booster system. You don’t have to pump as hard since it is much more efficient at keeping the pressure high and consistent as you pump. At 120 PSI, it won’t take long to pump your tires up. You also get tire patches and levers for fast on-the-go repairs. The Pro Bike Tool Bike Pump with Gauge Fits Presta and Schrader is designed to be a mini pro tool for avid cyclers. It is made out of high-grade aluminum so that it can pump at 120 PSI. The mounting system doesn’t require drilled holes for screws, allowing you to keep you pro bike undamaged. The pumping system is efficient so that you can fill your tires with less effort. That way, you can get back on the road faster while conserving your energy for the ride. This Pro Bike Tool Mini Bike Pump – Fits Presta and Schrader can be a great choice for riders with small under seat bags. It is only 7.3-inches long and fits in most small bags. It comes in two parts with the pump body and a separate hose. However, the hose fits inside the pump so that it never gets lost. With a strong metal body and a tight seal, this pump has no problem inflating bike tires. Despite its small size, the PUMPICO Bike Pump – Mini Bike Pump can be an effective tool to take with you when you ride. It inflates Presta and Schrader valve tires but comes with the needle attachment for balls too. The retractable hose keeps it clean and ready to use. With a 140 PSI rating, it can even inflate tires on small recreational vehicles like ATVs.